Hi Robert, It would be great to read your novel, if you want and have time, I would love a e-copy of your work. Bob, I finally had a chance to sit down and read Ticino Raiders cover to cover. I thoroughly enjoyed it. I hope you will write more along this line. First, bravo! Books are great! I read the preview and would love an e-copy, which you can send to wcanne@gmail.com. Were you publishing only in electronic copies, or did you have some physical books printed as well? If there are physical copies, I would be interested in purchasing one. E-books are cool, but I like my library. Sorry it's taken a bit to get back on here, my email is mamluk@yahoo.com. I look forward to reading it. Wonderful! I'm myself working on a novel but a completely different setting, but I actually started a landsknecht story some ten years ago. Never finished it, perhaps I will some day. I'd love to read your book. I don't mind sending a free copy to a few members of Landsknecht.Org - but I have to keep the numbers reasonable while I have a short-term contract with Kindle. A few they would regard as 'marketing support' - a lot could be seen as breach of contract, although it's not selling much at all at present so I doubt that they would get very exercised about it. Maybe I would chance giving-away 25 or so. To the genuine afficionados, ideally. Best wishes, Bob. P.S. Are you really called Karl Marx? 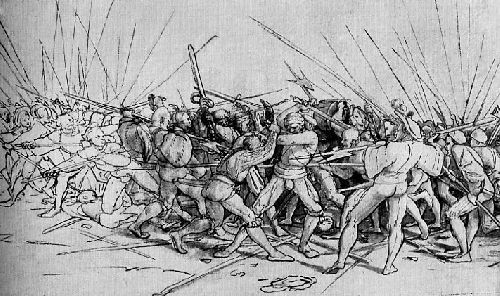 http://www.amazon.com/The-Ticino-Raiders-Landsknechts-Renaissance-e... or is there a better place to buy it? There is room for a sequel or two. I received the e-mail. I only just began reading but it is off to a good start. Hi Nicholas - let me have your email address and I'll send it to you. Just one comment - I am still working on it - I'm still finding typos! So if you find any - please let me know.